U.S. Ambassador to the United Nations Nikki Haley speaks during the emergency U.N. Security Council session Saturday on Syria. It was momentarily glorious to hear Nikki Haley, the U.S. ambassador to the United Nations,stand up for herselfagainst her male colleague at the White House. But don’t let that moment blind you. Responding to the suggestion, made byTrump’snewly appointedeconomic adviser Larry Kudlow, that there was “confusion” about the White House plan for Russian sanctions, Haley shot back. “With all due respect, I don’t get confused,” shesaidin a statement to Fox News’ Dana Perino, who read the comment during her Tuesday show. It was the rare power move made by the rarest of creatures ― an actual woman (of color!) in theTrump administration. Kudlow evenapologizedlater that day, though that doesn’t mitigate the fact that Haley was left out of critical decision-making and made to look like a dupe. Indeed, it was hard not to feel a little bit heartened by Haley in that moment. While a strong woman standing up for herself isn’t exactly novel in the Me Too era, spotting one in the male wilds of the White House is definitely a noteworthy occasion. But a tossed-off strong comeback doesn’t let Haley off the hook. She still works for ― and consistently defends ― a notorious misogynist accused by more than a dozen women ofsexual misconduct. I know it was like 12 news cycles ago at this point, but@nikkihaleyquote "With all due respect, I don't get confused" should go down as one of the best by a female leader. Ever. Said so much, with so few words. The Trump administration, Haley’s team, has worked relentlessly to curtail women’s rights, beginning in its earliest days when, surrounded by men, the president signed the so-called global gag rule that bars international health organizations from receiving funding if they mention abortion as a family planning option and may lead to a rise in maternal deaths around the world. The administration is also working tirelessly toroll back reproductive rightsin the U.S., haskilled reformsthat would have helped close the gender wage gap and has made itmore difficultfor women to report sexual discrimination. Haley is also clearly better than White House senior adviser Ivanka Trump when it comes to playing the strong, confident female leader in the press ― even as she backs the administration in its role curbing women’s rights. 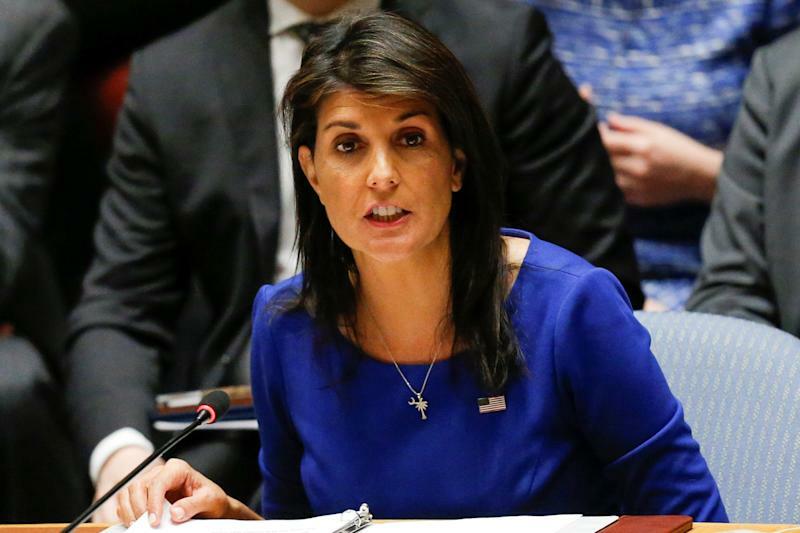 Indeed she is strong-willed, competent and principled enough that she seems to now be in danger of losing her job.The New York Timesreported on Wednesday that Trump is unhappy with Haley and she may be in line to take a Tillerson-like fall. Still, Haley is out there defending the White House. She argued in favor of the global gag rule just this week in an interview withMarie Claire. Haley smoothly responded to a question about a possible rise in unsafe abortions, a likely result of the Trump policy, by talking about women’s rights. It was an artful dodge that obscures the harm being done to women by the rule, whichhuman rights groups say is putting millions of women in peril by cutting off access to birth control and crucial health care. Haley also deflected a question about what it’s like to be a woman in an administration with a “challenging record on women” by saying she always tells Trump the truth. “Whether it’s the #MeToo Movement, whether it’s the rumors, whether it’s facing any other challenges that come along the way, I just try to be as honest as I can,” she said. Haley, who was the first woman ever elected governor in South Carolina, wasn’t always so clearly on team Trump. She first became known nationally when she pushed to remove the Confederate flag from the South Carolina statehouse ― not exactly a Trumpian move. But those days seem long ago. To Marie Claire, Haley also spoke about often being the only woman in the room. Indeed, there is a definite dearth of women in politics, particularly in the Republican Party. It’s inspiring until you think about the rooms she is operating in now, with a president who’s making a mockery of our democracy on the world stage and who has at every turn humiliated and undermined women (and men, too). Sometimes there are no women in the room because the room is a bad place to be.